One of the best things about the weekly Show Me Your Nerd show on Facebook Live is getting to actually touch priceless comics and other nerd paraphernalia. I’ve laid hands on the pen strokes of Jack Kirby and watched Amy Reeder’s noted two-handed drawing style in person. And then today, I saw a man open a long box of comics picked up at New York Comic Con over the weekend and discovered he’d turned a $300 issue of Cable & Deadpool into a $10 issue. It was devastating despite his cool exterior. Show Me Your Nerd made the trek out to Long Island City to meet with Stephen “Snow” Nieves, a noted local collector who hits nearly every comic convention on the eastern seaboard. His own judge of worth is “good art,” and he will spend hundreds to thousands every weekend on what he considers “good.” Then he’ll get it signed and wait to resell it for beaucoup bucks later. 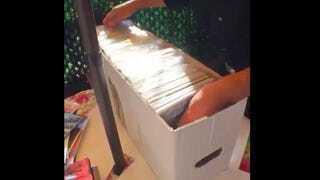 While showing off his collection Nieves also gave us great insight into what makes a comic valuable. While most of his advice is useful stuff like pressing comics to lay them flat, and collecting signatures to raise the price, he also gave us some great examples of what not to do—if you have a box full of comics always put them in a board and plastic.